Kompan's Story Maker Castle. Image from Kompan. An article in Dwell, written by Deborah Bishop looks at the history of the American Playground since the early 1900's, and those artists and architects or visionaries who sought to transform and inspire children's play. Japanese American artist Isamu Noguchi sought to replace the stock, single-use structures with "sculptural landscapes" of mounds, craters, steps, slides and peaks molded from earth. Beginning with Play Mountain in 1933 and culminating with the Levy Memorial Playground in 1961, designed over the course of five years with Louis Kahn for an eight-acre site in Manhattan's Riverside Park. 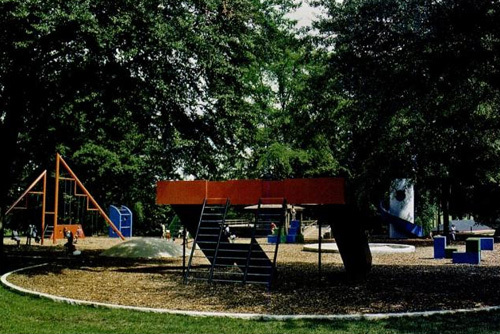 Playscapes, designed by Noguchi in Atlanta's Piedmont Park was built in 1976. Image from Dwell. Also around this time was the emergence of the architect Theodor Sorensen's "junk" playgrounds in Europe - see earlier post. Proliferating in bombed-out lots across Europe after World War 2; children built their own forts, tree houses slides and other amusements using scraps of timber, metal sheets and tools under the watch of a supervisor. Although adventure playgrounds were too 'rough and tumble' to flourish in America there was a post-war attitude for something new. In 1954 the MoMA and avant-garde toy company Creative Playthings co-sponsored a Play Sculpture Competition that attracted more than 350 submissions. Abstract in nature so as to inspire creative projection rather than a prescribed response with cubes, domes and spirals. Here, some sculptural play equipment designed by Noguchi in Moerenuma Park in Japan, which was built in 1988. The entire park was designed by Noguchi as "one complete sculpture". American architects and pioneers of play Richard Dattner and M. Paul Friedberg were inspired by Noguchi's sculptural playground designs and explored the needs of the chid's growing mind and body; and were interested in the connections between imaginative play, exploration and cognitive development: "An environment that provides only the familiar challenges that have already been overcome countless times, will never call forth any new learning" (Dattner, 1969). By observing how children choreograph their own entertainment in consruction sites and on city streets - running, jumping, swinging - both Friedberg and Dattner championed "linked" or "continuous" play, rather than offering one static experience per element. "The choice of what to do next becomes an experience. The more complex the playground, the greater the choice and the more enriched the learning experience" (Friedberg, 1970). 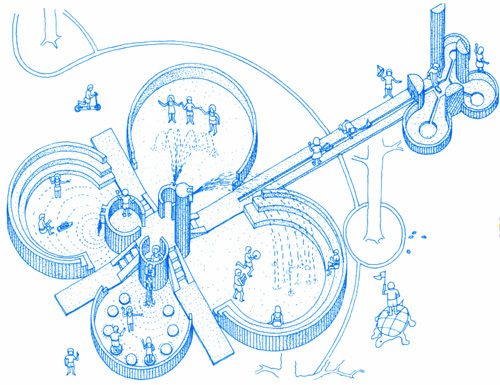 Richard Dattner's design for a playground for Central Park at West 81st Street. (The circular form were later changed to octagons and the water channel eliminated before construction). Image from Dwell. 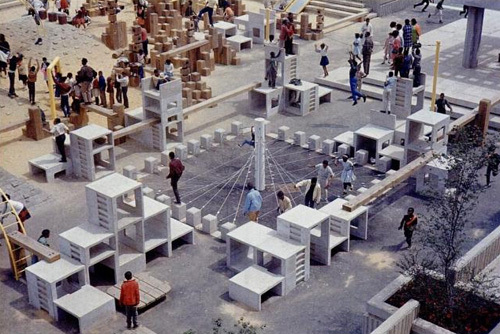 In 1966 Friedberg at the Jacob Riis housing plaza on the Lower East Side created a play venue for all ages - it featured a granite igloo, tunnels and ladders, a wood-timber area, a pyramid, a maze and arching monkey bars. "We created experiences comparable to those a child might find elsewhere in widely scattered areas - a mountain, a tunnel, a tree house - and brought those together into a single environment". Friedberg's "vest-pocket" park. Image from Dwell. His "vest-pocket parks" (which sadly no longer remains) transformed 'garbage-strewn' lots into creative play spaces. Dattner's lasting accomplishment was his adventure playground in Central Park (and was famously seen in the opening sequence of Sesame Street). A thoughtful and unified space encouraging improvisational play - children would stroll under a low tower and through a maze, "as if entering their own private world," wrote Dattner. 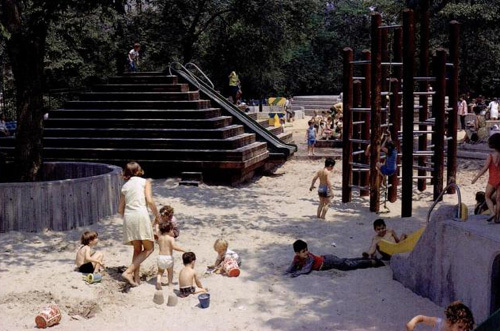 Dattner's Adventure Playground in Central Park, built in 1967.Image from Dwell. The playground included mounds, peaks, climbing poles, tree houses, a volcano notched with cobblestones and a crater composed of concentric walls... with multiple way of ascending, descending, and getting from here to there. Dattner incorporated some of the elements of the wilder European ("junk") versions. The original pyramid contained building and art materials handed out by a play supervisor, which allowed children to "rearrange their physical world to their liking. 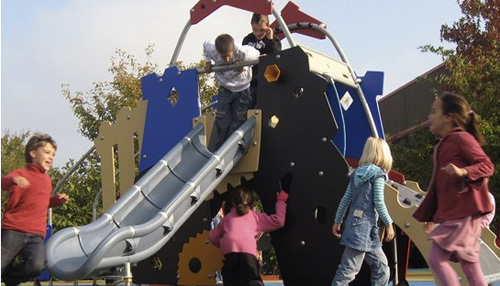 As Dattner says, "The next best thing to a playground that children design themselves is a playground designed by an adult but incorporating the possibility for children to create their own places within it." 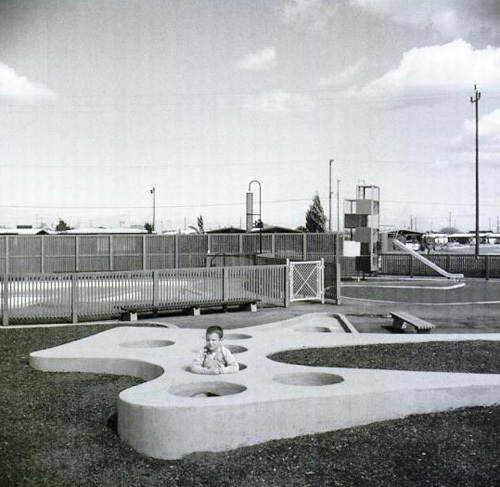 Another playground that was close to being demolished was the Tot Lot in Palo Alto, California's Mitchell Park, a curvy space designed by landscape architect Robert Royston in 1957. Utilising "modernism's free-flowing space...which was designed without corners so every child could be seen by his mother". The Tot Lot at Mitchell Park. Seen here is the Gopher Holes - a series of circles cut out of cement over a bed of sand that encourage jumping, peeking and burrowing. Image from Dwell. Unfortunately due to rising fears of safety, the brief era of the designer-built playground was short-lived. 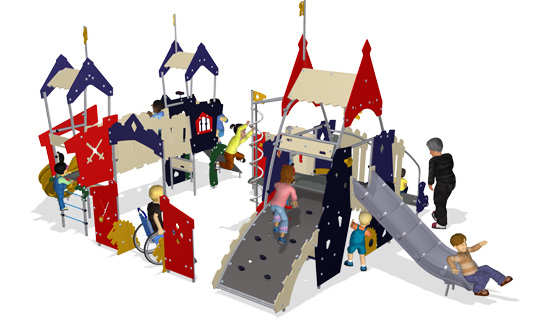 Despite Dattner's view that "no playground can prevent a child from being hurt, and if it protected him from upset completely it would convey the very misleading impression that he has got nothing to fear from his environment"; eventually these ideas were superseded by mass-produced structures that came with full liability insurance, if limited imagination. As Friedberg puts it so wonderfully: "Just as TV becomes an electronic babysitter, so do out existing play facilities become great, gray outdoor nannies, incarcerating children and protecting them from experience and involvement. The air may be fresh but the play is stale." 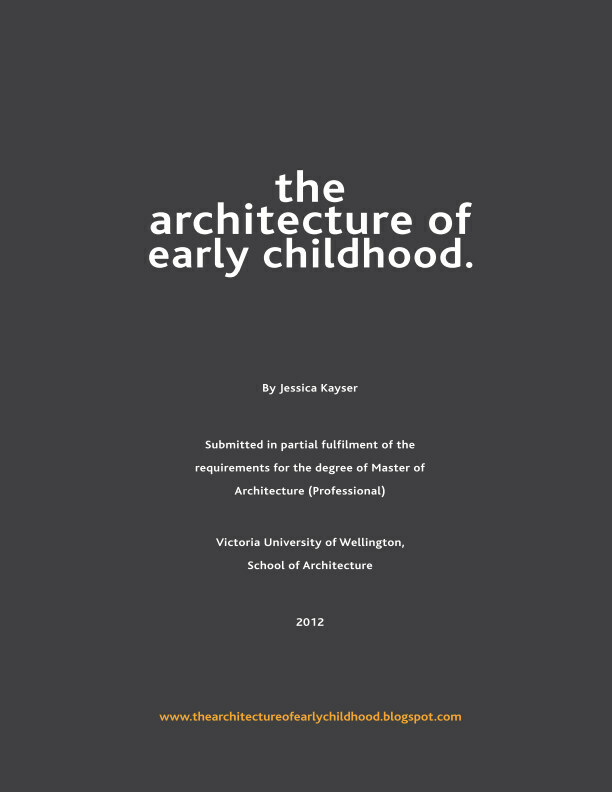 Via Dwell (Bishop, 2007), Ping Mag, American Playgrounds (Solomon, 2005) and Children's Spaces (Dudek, 2005).